Apple and cinnamon both flavours goes wonderfully together. 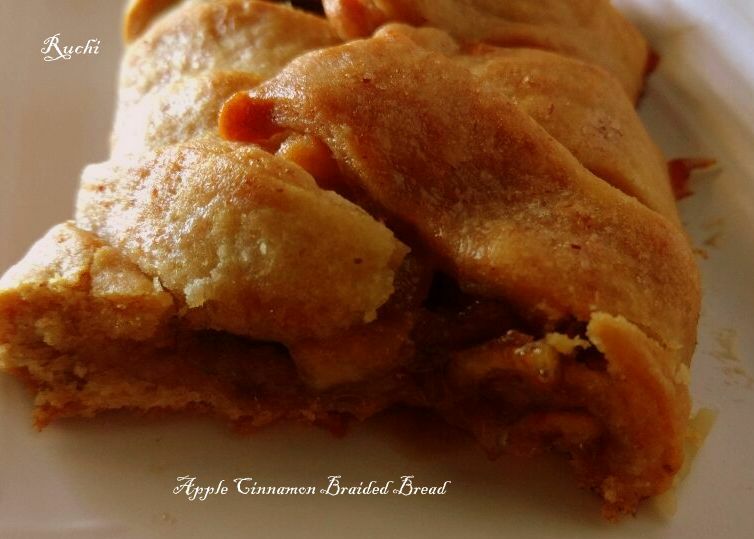 The fruity aroma of apples and the delicate smell of cinnamon fill the entire house with their magic. 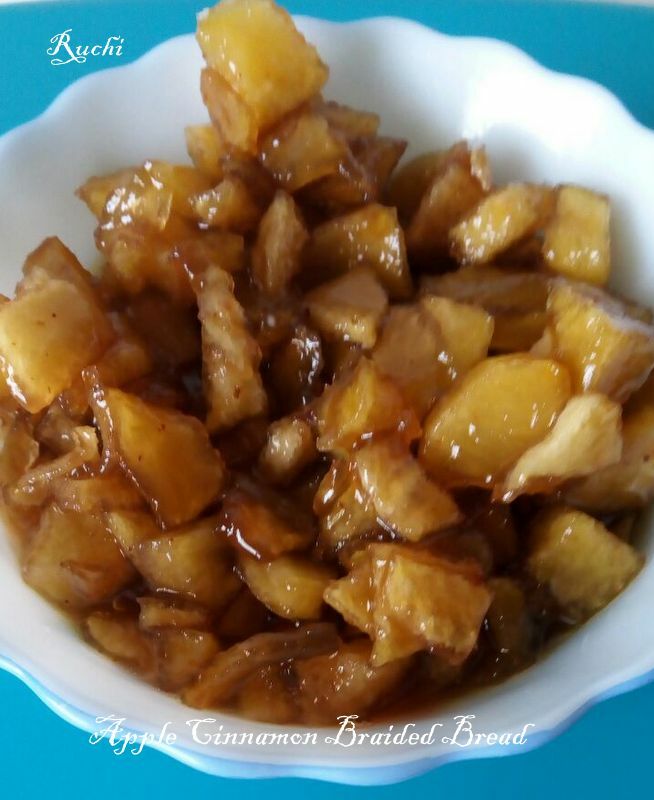 It's an easy recipe,especially I tried without yeast with common ingredients yet so delicious and very tempting. The smell in the house while baking is divine .The inside of bread is soo soft with crusty top, . Hardly could someone resist this rich and buttery, juicy mouth-watering braid looks to be unbelievably delicious .and it makes it perfect for breakfast /teatime snack or even for holiday season. Prepare the apple filling:Peel, core, and slice the apples into thin slices, then cut the slices in half. On the stove top, melt butter in a medium skillet. Add apples and sugars. Saute until apples are slightly softened, about 5 minutes. Set aside to cool. Prepare the cinnamon-sugar filling: Mix ingredients in a medium bowl until mixture is combined and lumpy. Prepare the cinnamon roll dough: Mix flour, sugar, baking powder and baking soda in a medium bowl. 1.In a separate bowl, use a whisk to combine the butter, applesauce, milk . Add the wet mixture to the dry ingredients and use a wooden spoon to combine until well mixed. 2.Remove the dough to a well-floured surface, sprinkling in more flour as needed to make sure the dough isn't sticky. 3.When the dough was ready, rolled it out into a big rectangle, then cut each side into strips. .
4. 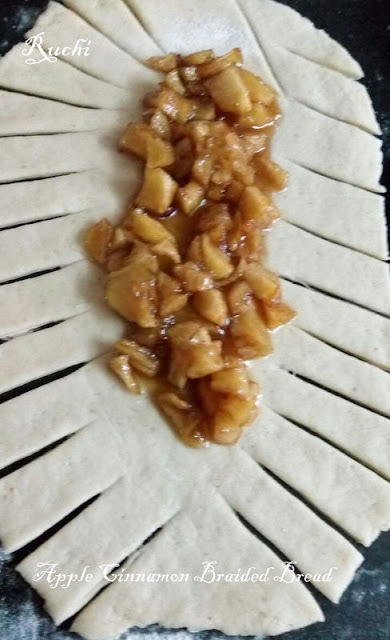 Spread the apple filling down the uncut center of the dough, and then Fold strips of dough into the center, crisscrossing the filling by alternating strips from each side. 5.Lightly press ends to seal, and straighten out the braid with your hands to create a braided effect. 6.Bake the braid in the oven for 25 minutes, or until golden brown. Remove from the oven and Brush braid with remaining melted butter, let the braid cool for several minutes.